Manning wore this color proudly every weekend, making millions of fans happy and equally proud of him by doing so. 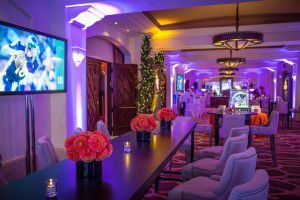 For his retirement party, it was important for our team at Jupiter Ambrosia Productions that this pride emanated from every detail of the event. The foyer included a tribute wall. 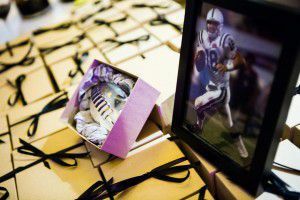 The setting was warm and familial, a hallmark of Manning’s personality and his legacy. 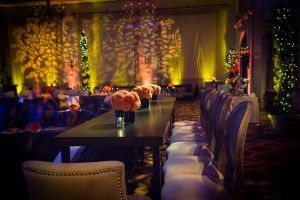 We ensured that the design reflected this from the moment the more than 200 guests entered the foyer of the ballroom. At the sign in desk, a loving photo, framed by the guest book and orange flowers set the tone for the evening. In the long foyer, communal tables were set with more orange flowers. 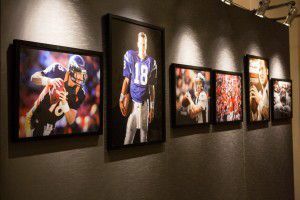 And along both walls, galleries of blown-up photos, magazine covers and highlights from Manning’s career created a museum-like tribute highlighting his greatest accomplishments on the field. But this was no stuffy affair. Gourmet sushi was followed by elegant flutes of champagne. 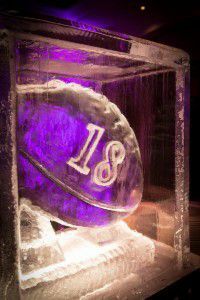 A photo booth was filled with well-wishers creating memories of the night and ice sculptures of footballs with Manning’s Number 18 carved into them served as table sculptures. 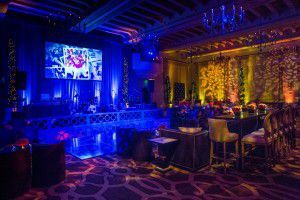 Inside the ballroom, we designed a lounge vibe that was simple yet elegant. Warm washes of light on the walls, layered with textured projections added layers of visual interest to the room without a lot of splash, in keeping with the personality of the guest of honor. Orange linen and flowers popped on the tables and the stage stood apart in its dark blue lighting. Later that evening, the dance band took the stage and Manning and his family would say one final farewell, a forward pass to the future that no one doubts is just as bright for this grid iron star. A memento of the fond farewell.